In our last encounter, DC Adventures Log 4: Before I Kill You, Mr. Aquaman, Team Lex invaded Black Manta’s lair, only to find their nemesis eating cereal without pants. Manta and Team Lex’s mutual confusion built when they realized both teams had been working for Lex Luthor. As they untangled their situation, Skeets appeared, informed the players that something was wrong with the time stream and Bzooweeoovzip! Bzooweeoovzip! After a dizzying jaunt through time, Team Lex and Team Manta find themselves in a fifty foot high marble hall complete with a giant supercomputer, an 840 inch screen tube television with the words “Trouble Alert” along the bottom, and a mammoth circular table surrounded by multiple egg-shaped chairs, the backs of which adorned with symbols like a large red ‘S’, a yellow lightning bolt and a green lantern. When the players identified Batman, Hawkman and Aquaman in front of the television at the far wall, they broke out their weapons and commenced firing. Team Lex and Manta missed in their initial volley of attacks, and were returned with winning smiles and introductions. Taken aback, the Team was transfixed as Sherlock Holmes and the Super Friends introduced themselves. While the teams discuss, Superman blurts, “This looks like a job for SUPERMAN!” and flies into space to tackle The Moon Monster. After swallowing Superman and spitting him into the sun, The Moon Monster lands on Earth and starts eating everything. The Trouble Alert flashes various disasters caused by The Moon Monster, so The Super Friends tells Team Lex and Manta that The Super Friends will handle The Moon Monster, and that they should help take care of the various disasters. After The Super Friends leave, Black Manta says that The Super Friends can shove it, and that he’s going to find The Legion of Doom. A little Abra Kadabra hypnotism, however, persuades Manta to help out, and, by the way, do you guys need a submarine? While the players respond to various threats, Gentleman Ghost tails The Super Friends. While Batman, Wonder Woman and company dance around The Moon Monster using the same three frames of animation, Gentleman Ghost approaches Hawkman, and informs him that there is something far more important to deal with than Moon-sized monsters swallowing mountains. Hawkman’s already super eyes go wide, as Gentleman Ghost teleports the two of them to a local coffee house to discuss. While The Gentleman knows that he is Hawkman’s nemesis, and cannot proceed to the afterlife until Hawkman’s demise is achieved, Hawkman seems oblivious to his new friend’s anger. 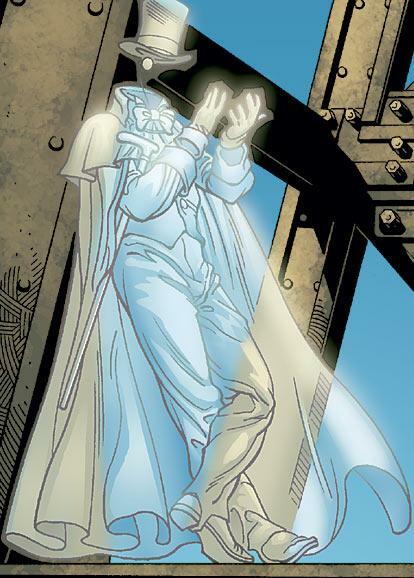 Spurred by Hawkman’s unrelenting ingnorance, Gentleman Ghost draws his phantasmal pistols and fires. Hawkman employs a strategy very familiar to The Super Friends: He attempts to hug Gentleman Ghost into unconsciousness. 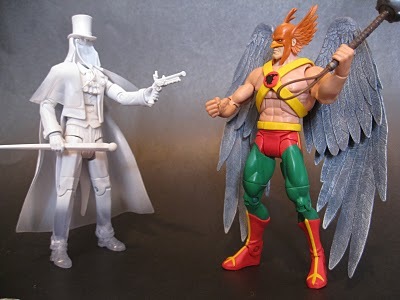 Gentleman Ghost uses this opportunity to drain the life out of his feathered opponent, only to find, despite Hawkman dead at his feet, that he can’t transend to the next world. Much later, Sherlock Holmes will explain to Gentleman Ghost, while pushing Hawkman into a ‘rejuvination chamber’ that death is unheard of here. 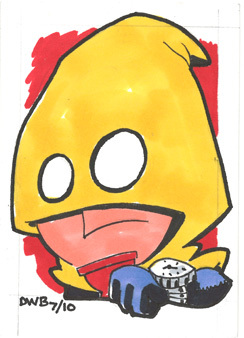 Hawkman walks out of the chamber freshened and ignorant of his previous altercation with a furious Gentleman Ghost. In the meantime, while Team Manta works to stop a nuclear reactor from melting down, Heatwave pilots Black Manta’s submersible into The Ocean to save a cruise liner full of people from a megatsunami. 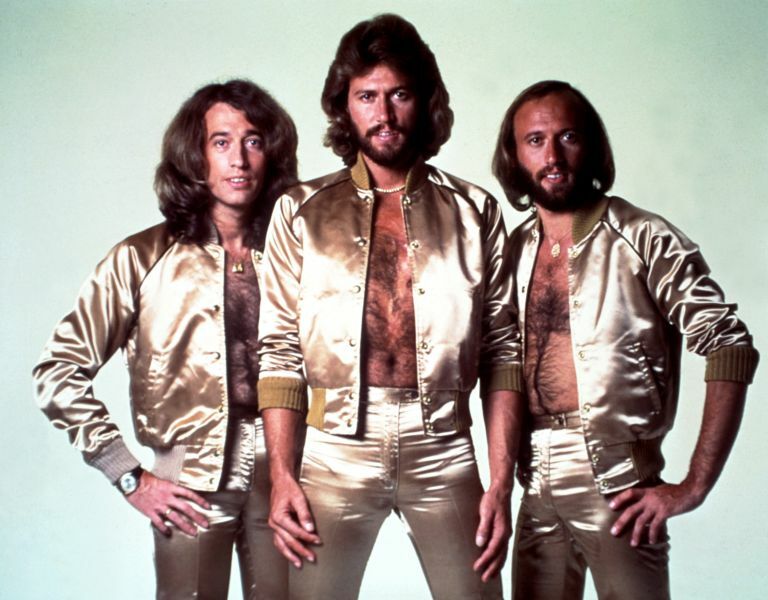 With the help of The Bee Gee’s disco groove, the passengers and crew of the ocean liner do the hustle into Black Manta’s vessel, which dives down a few meters to avoid the megatsunami which smashes the ocean liner in half, leaving nothing but boogey boarding Bee Gees. As the megatsunami rushes to greet the coastline of A City, Abra Kadabra reverses the direction of the waters, and makes a phone call to warn that The Bee Gees will be smashing into Europe on a giant tidal wave. His news is greeted with many cheers. As Hourman travels from disaster site to disaster site, he begins to break down. Every time he changes location, he visualizes stars racing at him, and all sense of time and distance are lost. In frustration, he rushes to the site where The Moon Monster is and leaps at it in hopes of a quick death. The Moon Monster eagerly swallows him up. Briefly afterward, a hot air balloon swings by, blasts The Super Friends with an energy beam that makes them one inch tall, scoops them up and flies away. As Sherlock Holmes watches the footage, he notices that the balloon bears a striking resemblence to a hot air balloon used in the 1893 Chicago World’s Fair, and directs the team there. Heatwave jams the afterburners in Manta’s Sub, launching it into The Moon Monster, launching Hourman out of The Moon Monster, and launching The Moon Monster into space. At the site of the 1893 Chicago’s World Fair, the players find a large castle, installed with satellite dishes and a Siamese cat, both of which shoot shrink ray beams. Inside the castle, Team Lex finds Dr. Gulliver who wants to shrink everyone in the world to help save resources. The Doctor is easily handled, the wires are reversed in Dr. Gulliver’s shrink ray, and everyone is returned to their normal size (much to the chagrin of Sherlock Holmes, who, when the process appeared irreversible, suggested shrinking The Universe to fit the size of The Super Friends. Both threats taken care of, Team Lex is lead back to the Hall of Justice, and The Super Friends offer them Honorary Super Friends Badges. The ceremony, however, is interrupted as one of the walls in The Hall of Justice explodes and is replaced by a platoon of U.N. soldiers. The Super Friends are riddled with bullets, including kryptonite bullets for Superman, and yellow bullets for Green Lantern. The gunfire stops, and a large gunsuit with a giant U.N. hat and an oversized corn cob pipe marches into the demolished hall. Inside the walker, a decrepit old man in the uniform of a general, barks out through his intercom, “Team Lex? No matter! I’ve killed you before, and I’ll do it again!” Before the gunfire sprays another round, a time portal opens up, and Skeets pops through it. “I’ve got to get you out of here!” Skeets explains, “What year are we going to?” Someone blurts out ‘1953!’ and Bzooweeoovzip! Continue on to DC Adventures Log 6: All Hail Riverdale! We had a lot of fun with this particular episode, but I need to give props where props are due. I wouldn’t have had one half of the craziness in this retro-Super Friends episode if it wasn’t for Seanbaby’s article 6 Super Friends Villains That Didn’t Give a @#%*. See you all in Log 6! 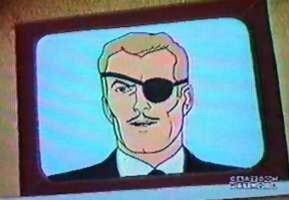 Posted in DC Adventures and tagged Dr. Gulliver, Falcon 7, Props to Seanbaby, The Moon Monster, Why Won't Hawkman Die! OMG, why did you not use the Rock & Roll space bandits?! Ha! I really wanted to, but I didn’t think they’d translate as awesome as they do when you witness those guys. I mean, I mentioned them in passing at the end of the session, and no one went berserk. Fine. This is a category.